In June of 2013, Friends of Ecological Reserves applied for funding support to work with regional Parks staff to review ER-specific files held in regional offices. The goal was to look for ER-specific information not already on the Parks website (http://www.env.gov.bc.ca/bcparks/eco_reserve/) or on the Friends of Ecological Reserves website (http://ecoreserves.bc.ca/). In 2012, FER had reviewed files in the Parks Victoria office file room and found a significant number of ER-specific reports that were filed but not accessible digitally on the web. FER was encouraged that so much information had been retained over the years when there was an Ecological Reserves Program, but concerned over potential erosion and loss of this information over time. Since changes were made to the Ecological Reserves Program over a decade ago, it is no longer possible to go to Parks’ headquarters file room and obtain ER-specific information as all new information is being held solely in regional Parks offices. Mike Fenger FER, Jessie Moore (Area Supervisor) and Garry Fletcher in the Parks Black Creek Office. Jessie manages eight ecological reserves (ERs) in the Cape Scott area. Mike and Garry with Jessie’s help were assessing ER information held in Parks files. FER had planned to visit all regional offices in a single year but Parks wisely agreed to pilot the ER Research Legacy Project in a single region – the West Coast Region. This is a summary of that pilot project. FER had allocated $1,000 for this project should it be needed, in addition to the $2,500 received from the Parks Enhancement Fund (PEF). Much of the time spent by the FER team was volunteer time. FER members Garry Fletcher and Mike Fenger worked with Conservation Specialist Erica McClaren to set up meetings with all Area Supervisors for the Parks West Coast Region. These meetings were to assess and retrieve research and ER-specific information held by Parks staff or by ER wardens as reports sent to Parks staff. This information was to be made available to FER for the purposes of inclusion on the FER website and prevent erosion of the legacy of information already accumulated from coastal Ecological Reserves. 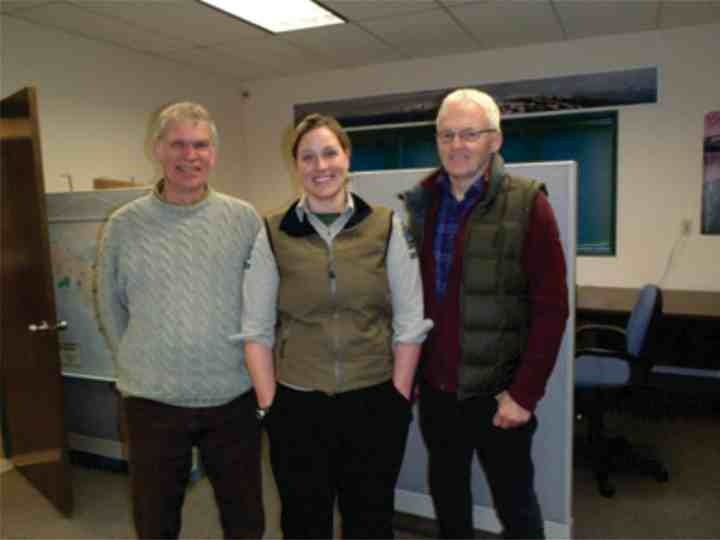 The first meeting was attended by Erica McClaren the FER regional contact person, and was held in the Goldstream Park office with Area Supervisors Joe Benning (9 ERs), Don Closson (5 ERs) and Zsana Tulcsik (4 ERs). A second meeting was held in the Black Creek Parks office with Jesse Moore (8 ERs) and a third conference call meeting was held with Lucy Stefani Area Supervisor on Haida Gwaii (5 ERs). Two working meetings with Erica McClaren were held in the Nanaimo warehouse/file room. Reports found or made known during those visits were assessed for biological information value and whether they were already on the FER or Parks web pages. It is estimated that over 800 reports were reviewed and that over 150 passed the “biological information legacy test” and are being placed on the FER web site by Garry Fletcher. There was no general public involvement with the data gathering and assessment of Parks-held ER information. There is expected to be public involvement over time as people access the information on the FER website. However, this public involvement can be difficult to precisely assess. FER receives weekly web summaries of web visits. These vary, but it is normal to have 8,000+ visits weekly and the visits are primarily from Canada, US, Great Britain and China. A fairly high percentage of visits can be traced to web crawlers as they come from cities with computer centres that troll the web. However, if we discount these numbers, there remains a significant number of visits. This extension of information is consistent with the intent of the Ecological Reserves Act to provide research and educational materials. Approximately ten ER-wardens were contacted to learn more about what they may have in their files that could go on the FER website. After conversations with Areas Supervisors, we learned that there is an increase in the number of ER wardens including a new warden who took on multiple reserves. It was good for FER to contact wardens and clarify the role FER sees for itself and how this supports the more formal relationship between the ER warden and Area Supervisors through their signed agreements. FER’s role supports ER wardens and Areas Supervisors but it does not supplant their work. FER sees its role as a custodian of information and an advocate for ERs. To be successful in that role, FER needs to obtain information that passes between an Area Supervisor and ER wardens. Information that ER wardens and Area Supervisors make available will be of future value. Based on the Coastal Pilot Project, a high level of sharing ER-specific data has not yet been consistently achieved. FER did not partner with other ENGOs as this project was considered fairly specialized, and the review of government filings did not lend itself to broader participation. The project team did contact some ER wardens but this was not in a comprehensive manner. Some ER wardens contacted did not respond to requests for field reports or images. Most of the new biological legacy information on specific ERs was obtained after there was a one-on-one meeting between the FER team and the Area Supervisors and Conservation Specialist. We felt that this was achieved as a result of being able to more fully explain our intentions and Area Supervisors agreed with the value of creating and maintaining an open web-based filing system for each ER. These meetings built a level of trust between the FER team and Parks staff, not possible through initial contacts made solely by e-mails. Meeting with Area Supervisors who had responsibility for multiple reserves was especially important. One-on-one meetings were held with Erica McClaren who coordinated the Parks side of this project and who worked to gain access for FER to Nanaimo file room reports. Erica was also able to provide technical support by digitizing older paper reports. This worked well and allowed Erica to understand the ER-specific information data base. Erica was also able to review her own digital files on ERs and provide data from that not held in the file room. One-on-one meetings were also held with Jessie Moore in the Black Creek office. Jessie manages eight ERs on the north end of the Island. After that meeting, Jessie too was able to review her digital files and provide important reports not found in the file room. A conference call one-on-one meeting with Lucy Stefani who manages five ERs on Haida Gwaii and follow-up phone calls made with Don Closson who manages four ERs out of the Goldstream office yielded similar results. There was a belief expressed during the meetings that the research legacy information sought by FER would be held and managed through the Permit and Authorizing Bureau http://www.env.gov.bc.ca/pasb/. It was learned that the permitting process is not a data capture and information storage/tracking system. The permitting process is a conduit for tracking applications which are sent for approval to Area Supervisors. FER learned that there are currently 27 active research/education permits and this doesn’t include the research being conducted by BC Parks staff, which, although not done under permit, should be made better known. FER learned that better preplanning leading to more one-on-one meetings with Area Supervisors may improve capture of existing regionally held ER reports and is considered more likely to establish confidence and a willingness to share future reports with FER. Change in sharing was partially achieved with some Areas Supervisors and some ER wardens. FER expects to see a slight increase of reporting from ER wardens and Area Supervisors and those who saw the benefit of ER-specific data capture outside of government. The inclusion of the FER website as a data handling and retrieval system has not yet been fully achieved. FER is fearful that there will continue to be loss of valuable data currently held by ER wardens and Area Supervisors in the West Coast Region.